“Investors have been the target of a number of regulatory interventions and we are now seeing this impact on residential building activity,” says HIA Senior Economist, Geordan Murray. ABS data released yesterday showed that the number of dwelling starts fell 5 per cent in the December quarter, dragged lower by a 11.7 per cent decline in apartment starts. “Investors have been the target of a number of regulatory interventions and we are now seeing this impact on residential building activity,” said HIA Senior Economist, Geordan Murray. In the final quarter of 2017, detached house commencements increased by 0.7 per cent, while starts for other dwelling types, which are mainly apartments, declined by 11.2 per cent. “The decline in multi-unit dwelling starts has dragged down the total number of new home starts during the final quarter of 2017," said Murray. “In contrast to the decline in multi-unit starts, the resilience of the detached house market continued to shine through," said Murray. Across Australia, 218,842 homes are being built, down just 2.4 per cent on the 224,314 record set in September quarter 2016. The value of construction work still to be completed stands at almost $68 billion, but with the $26 billion worth of projects yet to be started, the total construction work in the pipeline is worth $94 billion - the highest on record and trending higher, up almost 13 per cent for the year. Craig James, chief economist of CommSec, writes, "The problem for the industry is that workers are hard to find and costs are starting to lift. For the Reserve Bank on inflation watch, here is the place to start watching." The value of residential and commercial building work in the pipeline stood at a record $94.2 billion at the end of December, up 12.8 per cent on a year ago. “The combination of falling commencements and the build-up of dwellings in projects awaiting commencement is somewhat concerning. It is likely to indicate a slowdown in pre-sales activity," said Murray. “With additional taxes on foreign investors and regulators clamping down on investor lending, investors have retreated from the market," he said. Master Builders Australia noted the data shows the significant contribution of the building and construction sector on the Australian economy. “The data shows the nation’s second largest industry ended last year strongly, with the value of work done growing by 8 per cent in the last quarter of 2017 and contributing more than $28 billion to the national economy,” said Master Builders Australia CEO, Denita Wawn. “The value of work for new residential construction fell by 5.4 per cent in the quarter, supporting an outlook for a more moderate year for new residential construction in 2018,” Wawn said. Click here to view the ABS building approvals data. Click here to view the ABS building activity data. 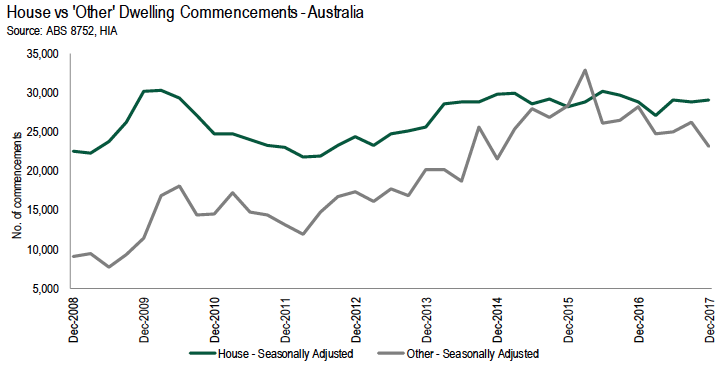 Click here to view the ABS construction activity data.